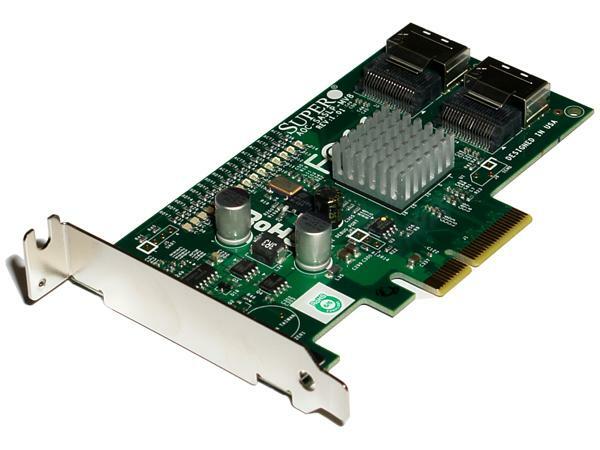 I have been using the Supermicro AOC-SASLP-MV8 host bus adapter on quite a few Linux machines recently. Supermicro/Marvell only provide stable drivers for Windows and a select few (outdated) Linux distributions. I had to rely on the open-source support in the drivers/scsi/mvsas tree of the Linux kernel. Regressing the system back to a supported configuration (Fedora Core 9) and using the proprietary driver solved the stability problem. The controllers came shipped with the 3.1.0.15N firmware, however upgrading this to 3.1.0.18 or 3.1.0.21 didn’t resolve the issues using the open-source driver on modern kernels. Rather than persist with an ancient configuration I opted to switch to a different HBA with stable Kernel support in drivers/scsi/mpt2sas; the LSI SAS 3081E-R host bus adapter.